The tastiest banana pudding also happens to be the easiest to make! I’ve been on this banana pudding kick lately, which has greatly benefitted my friends and neighbors and their kids. Even though Regina and my own kids love the stuff, we simply couldn’t eat our way through the three huge batches I’ve made recently. We needed help and so Julie and Tim and Zach and Sarah have gotten containers in the past week; I believe they shared them with their kids but it’s possible they didn’t. This banana pudding has a way of making your forget your vows, disregard your children’s welfare, and consider committing higher crimes. Zach refers to the pudding as his “afternoon delight” which conjures up images better left unimagined. The recipe for this banana pudding is old-fashioned and simple to make. You don’t start from scratch, you start from mixes, like lots of the great American comfort foods of the past fifty years. Canned milk and pudding mix and boxed cookies. Super-easy and super-yummy! If you’ve ever been to Magnolia Bakery either in NYC or LA you might notice that their banana pudding tastes remarkably similar to this. Well, it should. It’s their recipe and I happily cribbed it. Because it is superb! In a stand-up mixer whip together the condensed milk, pudding mix, and water for about two minutes at medium speed. You could use an electric hand mixer if you don’t have a stand-up Kitchen-Aid mixer, of course. Make sure after you’ve whipped it that you don’t see any yellow specks, which would be undissolved pudding powder; beat it a bit more if you need to. Pour pudding into a big mixing bowl and chill until completely set, maybe three hours. When the pudding is set whip the heavy cream to stiff peaks. Fold the whipped cream gently but completely into the pudding mix. It should be well-combined and not streaky. Into a big deep bowl put about a third of the cookies in a layer. Top with a third of the bananas and a third of the creamy pudding mix. Make three layers. Chill for at least four hours so the Nilla wafers can soften nicely. I like to make it the day before. It improves with a full overnight chill-out. It will last three or four days refrigerated although I have no doubt you and your fam will polish it off before that! I like this cute pink pudding goblet. Thanks for the loaner Julie Semple! Leftovers make a lovely lunch. 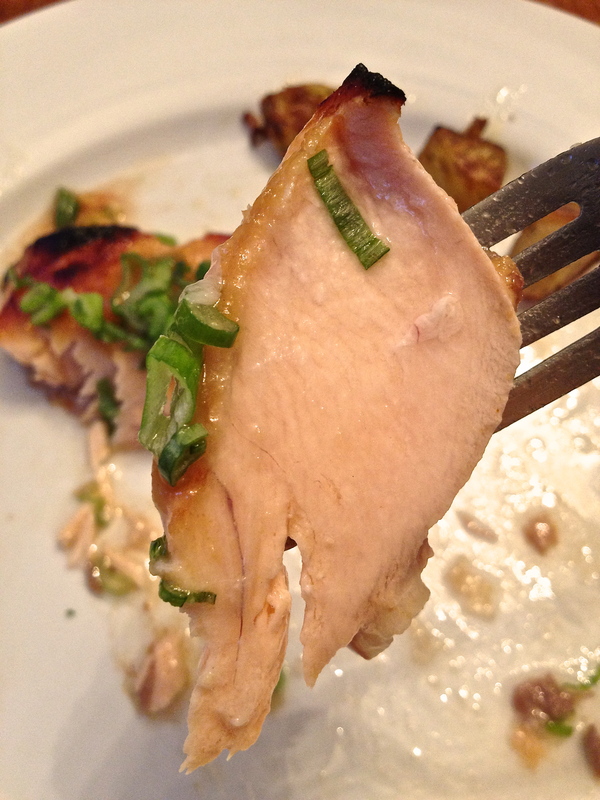 Today’s brief post is about using leftovers to good effect. 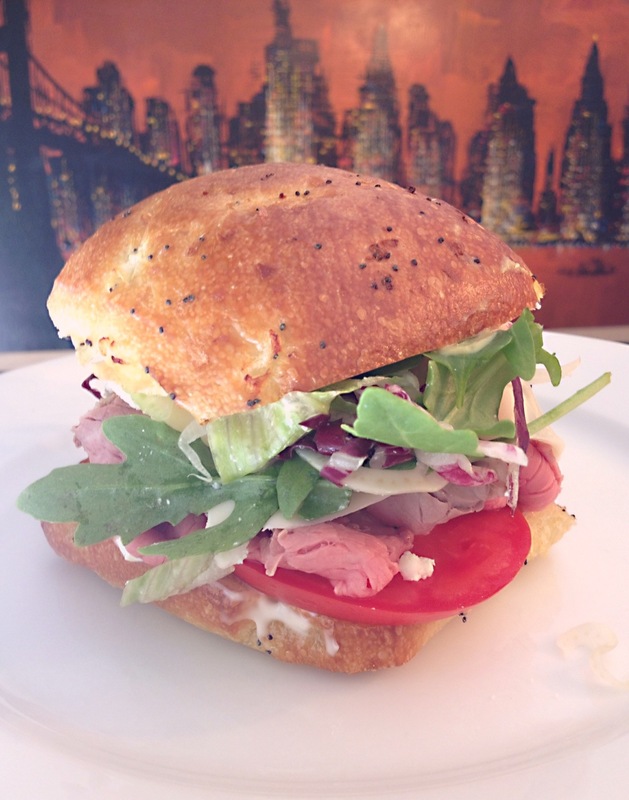 The night before I made this killer sandwich I’d cooked a large prime shell roast. If you’re not familiar with the term a shell roast is basically a huge New York strip steak roasted in the oven. This one was eight pounds, the equivalent of about ten big thick delicious New Yorks stuck together. I’d seasoned it simply and rubbed it with olive oil. I roasted it at 325ºF for about an hour. I pulled it out when I got a temp reading of 120ºF on my instant-read thermometer. This is considered rare but I knew it would continue cooking outside the oven for a little while. The shell roast was a huge success and mostly devoured; I’m glad a little was leftover because there are few things I love more than really great cold roast beef. Especially when it’s a superior hunk of roast. So I shaved a little of the beef into thin slices and knocked out this delicious sandwich. I lightly toasted an onion roll and slathered homemade mayo on the bottom half. On the top half I smeared a bit of incendiary spicy mustard from Phillipe’s (the LA landmark restaurant which introduced the world to the French Dip sandwich). Two big slices of brandywine tomatoes went on the bottom bread and over that a mound of that shaved beef. I added a slice of Jarlsberg cheese and topped the cheese with a clutch of leftover salad (iceberg, arugula, radicchio, shaved fennel, and crumbled goat cheese). I put the top bread on the and closed up the sandwich, which I promptly ate without ceremony. And the sando was AMAZEBALLS, as they say. Not pictured is the bottle of Asahi Black Lager that I drank with the sandwich. * and maybe eat the horse afterwards. Hey, I’m OMNIVOROUS! Cool and refreshing zaru soba! Summer is nigh upon us and as the weather heats up it’s natural to crave foods that are cooling, refreshing, healthy, and light. Sometimes when the sun’s beating down and the humidity is creeping up I crave Zaru Soba, a classic Japanese dish of chilled noodles with a cooling dipping sauce on the side. It’s pretty simple to make, very healthy for you, and it’ll definitely refresh you on a sultry day. The dish is made from soba noodles that have been boiled for three minutes and then drained and washed in cold water to stop the cooking process. They should be a little toothsome, but perhaps not as chewy as Italian pastas cooked classically al dente. The soba should be refrigerated for at least an hour before serving. The most widely available soba noodles are made from a combination of buckwheat flour and wheat flour, but for this version of Zaru Soba I used cha soba, noodles that have been made with powdered green tea, which gives them a lovely emerald hue and an elegance that the more rustic soba lacks. 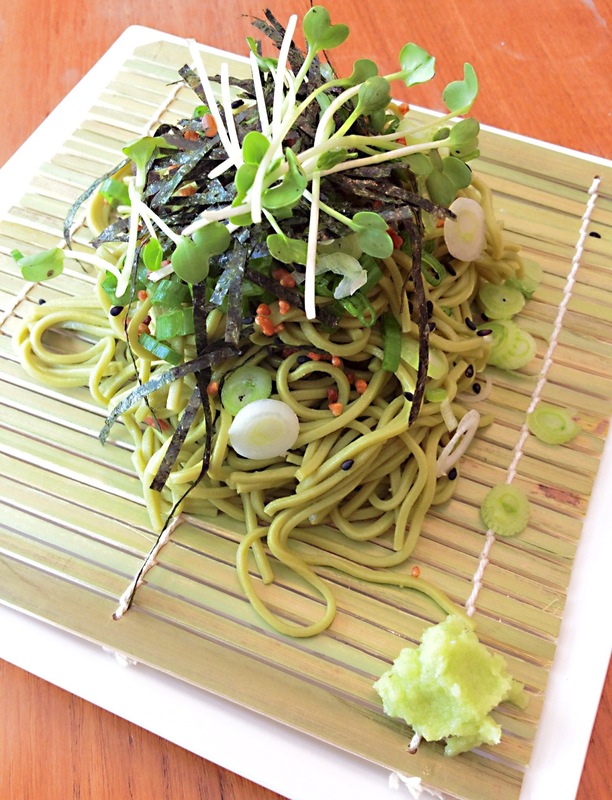 If you have a good Japanese market near you look for the green tea noodles — they are fantastic! Also, if you have access to a decent Japanese market ask for a zaru, which is a sieve-like bamboo mat that chilled soba is traditionally served on. Although you’re supposed to dip the noodles into the cold men-tsuyu sauce on the side, I’ve seen people pour the sauce over the noodles on the zaru; the gaps between the bamboo slats allows for excess sauce to drip off into the plate below, allowing you to have just enough of the dipping sauce clinging to your noodles. It’s simple and quite ingenious. Men-tsuyu is a simple sauce made from dashi, soy, and mirin and it’s served chilled. I recommend that you start with your own homemade dashi broth (check out my link below) but you can use the instant powdered variety (Hon-dashi from Ajinomoto is one brand I’ve used). Or save even more time and buy the dip pre-made and ready-to-go; you’ll find it in bottles on the shelf at your local Japanese market. It’s not quite as fresh and tasty as the stuff you make from scratch, but it will do in a pinch, especially if this is your first attempt. I really hope you have access to a decent Asian market, but if your neighborhood doesn’t have one try online at asianfoodgrocer.com, which should have everything you need. 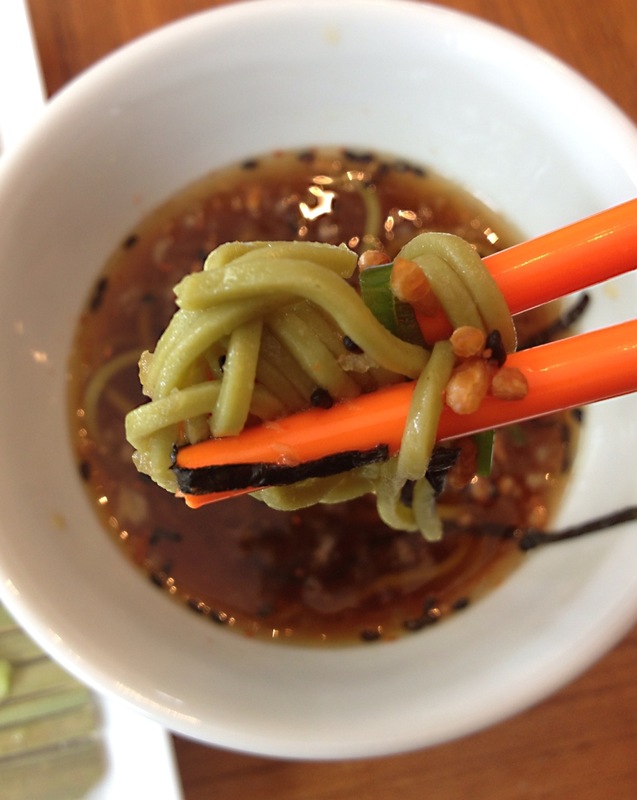 The noodles are topped with lots of sliced scallions and shredded nori (dried pressed seaweed — ya know, the kind you wrap up sushi rolls with). In addition I added a sprinkle of black sesame seeds, a few daikon sprouts, and some little bits of crunchy toasted brown rice (genmai), which is typically tossed into green tea for a rich, roasty flavor but which I like to add to the noodles for a little textural zip. The men-tsuyu should be served in a bowl on the side, with wasabi as a option to mix into it. A little grated fresh ginger might be a nice substitute if you’d like. Sometimes I’ll also add a little shake of ichimi togarashi, a lovely Japanese chili powder, for a bit of extra heat to the dipping sauce. I used fresh wasabi root grated on a sharkskin-lined paddle designed for that sole purpose, but both fresh wasabi root (and the sharkskin grater) are rare and expensive. Use prepared wasabi in a tube or a paste of wasabi prepared from powder. Don’t these chilled noodles look yummy? Me so hungry for miso salmon. This is a version of that ubiquitous sushi joint staple, misoyaki black cod, popularized with a vengeance at Matsuhisa restaurant here in LA (and at over thirty other affiliated restaurants internationally) by famed Japanese chef Nobu Matsuhisa. It’s Nobu’s signature dish, and the impact of his influence is felt in nearly every sushi bar in American, where some version of miso-marinated broiled fish is on virtually every menu. And for good reason as it’s damn good — sweet, salty, tender, and rich. It can feel fancy or it can be served very simply, almost rustically. It makes a great lunchtime or dinnertime main course, or it can go alongside other Asian dishes for a larger spread. I love to make it with black cod, of course, or butterfish or ling cod or Chilean seabass or pretty much any other fish that is either delicate or has a decent fat content. I was initially going to make this with black cod, but I found some beautiful and very fresh wild salmon and decided to go with that instead. I deviate from Nobu’s original recipe by adding a bit more flavoring to the marinade; if you know me you know that I can’t resist tinkering with classics in the hopes of finding greater complexity and depth of flavor — hence the addition of ginger and garlic and salt and pepper. I recommend marinating the fish for at least six hours, so make the marinade in the morning and drop the fish in. By dinnertime you’ll be good to go. If you really want to plan ahead you could marinate the salmon overnight, although I wouldn’t go for two days as the sodium in the marinade could dry out the fish and make the miso flavor too assertive. Serve this with steamed white rice and maybe some stir-fried bok choy or other Asian greens. I also recommend having on the side a little soy sauce and something spicy like sambal oelek or sriracha. First cut the salmon filets into four evenly-sized pieces. Place the filets in a flat plastic container with a lid or a glass pan that you can cover with plastic wrap; use anything except a metal container that could be potentially reactive (i.e. aluminum). Also, choose your container wisely; you want the fish to be snug in whatever container you choose so that the fish is nestled in and covered fully by the marinade. Refrigerate fish while you make the marinade. In a small pot mix the mirin, sake, and water. Heat over medium-high heat until boiling and add the sugar, whisking until it dissolves. Turn off the heat and whisk in the miso, ginger, garlic, salt, and white pepper. Transfer the marinade to a bowl and allow it come to room temperature. Pour marinade over the fish and turn pieces to fully coat with the miso. Cover and refrigerate. Now wait patiently a few hours. To cook turn on your broiler and set the oven rack about six inches away from the heating element, be it flame or electric coil. Remove the fish from the marinade and place on a sheet pain that been very slightly oiled. Any excess marinade you can pour into a small pot and bring quickly to a boil. Turn off heat. Now you can use the marinade to baste the fish. Put pan with salmon into the oven and broil for about three minutes. Remove fish from oven and, using a pastry brush, baste fish with more marinade. Return the fish to the oven and broil for another two or three minutes, approximately. You want the edges slightly charred, so when that occurs remove the salmon and prod it to check for doneness. I like it cooked through but very tender and a bit rare. Touch it with your finger — the flesh should have some softness to it. If you suspect it’s not cooked enough to your taste, turn the oven off and return the fish to oven. Allow it to cook with the oven’s residual heat until it’s firmer and more to your liking. Transfer fish to a platter and serve dinner! Super-succulent salmon served for supper. Say that five times fast! Super-healthy krunchy kale salad is good for the body and easy on the eyes. This salad is very easy to make and it’s a great introduction to kale for people who are convinced they don’t like greens. It’s also damn good for you, kale being chock full of vitamin K, vitamin A, vitamin C, vitamin B6, calcium, magnesium, folate, iron, dietary fiber, thiamin, and protein. So now you have no excuse for not eating this salad! To make the salad take a bunch of Tuscan kale (the kind with the very dark green, petal-shaped leaves that are flatter than the standard curly-leaf kale) and pull the leaves off of the stems. The stems can be quite bitter and are too chewy to be pleasant anyway, so discard the stems. Wash the kale thoroughly in cold water and then spin dry in a lettuce spinner (or drain and pat dry very well with a clean towel. With a sharp knife chop the kale into relatively fine shreds. Don’t worry about it being uniform; nobody’s judging you on your kale-kutting. Put the kale into a mixing bowl and squeeze one lemon over it. Add two tablespoons of extra virgin olive oil, one garlic clove (smashed and finely minced), about a teaspoon of kosher salt, and a bunch of cracked black pepper. Using your hands toss everything very well. Let the salad sit in the refrigerator for at least one hour. After an hour or so add a half cup of finely sliced red cabbage, a half cup of crushed pita chips (I use Waleed’s brand. ), a quarter cup of crumbled aged manchego cheese, about two tablespoons of crushed almonds (slivered is fine), and about a tablespoon of chopped cilantro. Toss it all together and then check your seasoning — adjust salt and pepper to taste. Now eat it! And feel that healthy goodness course through your body. 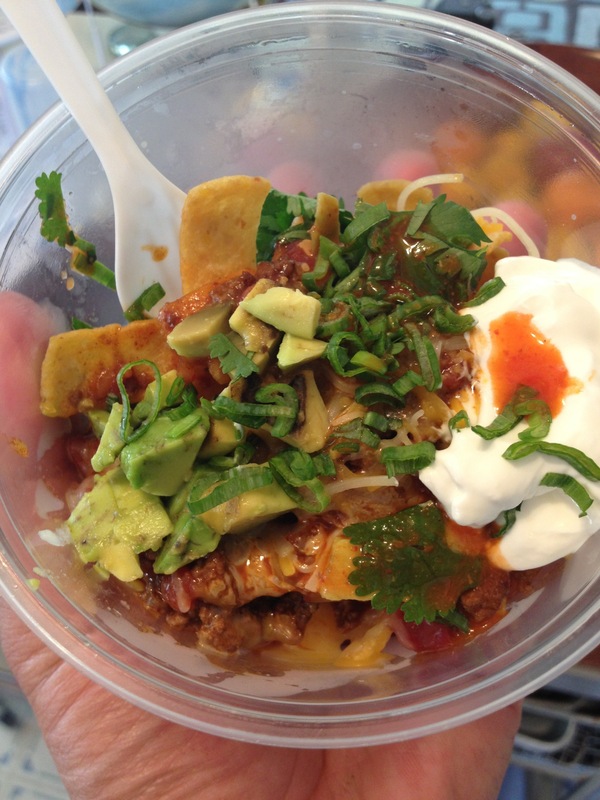 Would you believe that Frito pie is actually good for you? Well, it ain’t. Frito Pie has been on my mind of late. The warm weather has me conjuring up thoughts of State Fairs and picnics and baseball games and other specifically American outdoor events that suggest foods eaten out of hand and foods that defy all conventional “healthy-eating” sensibilities. Frito Pie is one food that fits both criteria — it’s portable and well, disposable, and it’s virtually devoid of any redeeming nutritional value. However, it is super-yummy in all its gleefully white-trashy, grease-bomby way. I like it! It reminds me of my youth and my Southern ties, of hot weather and festival foods. Now there’s a school of Frito Pie theory that suggests a baked casserole sort of construction, like some kind of bastardized Tex-Mex lasagna or ghetto-style enchiladas. Sure, you bake a bunch of Fritos (and no other corn chip is acceptable) with chili or ground beef with cheese and salsa and you know that’s going to be tasty treat. But to me that’s not really Frito Pie even if it kind of resembles a pie; to me Frito Pie is the so-called “walking taco” whereby you cut open a snack-sized bag of Fritos (the one and only) and you dump into it some hot chili (preferably beanless), some grated cheese, some sour cream and then maybe some other garnishes like jalapenos, hot sauce, chopped scallions, guacamole, etc. You scarf that down with a plastic fork (or spork, if you should be so lucky) and wash that down with an ice-cold PBR or Dixie (or Shiner Bock, if you should be so lucky) and that’s good eatin’, y’all! For an afternoon snack today I made a totally delish Frito Pie. Because I had only a large bag of Fritos, I put it into a plastic deli cup and I ate it with a plastic fork. This presentation approximated the portability of eating out of a greasy plastic bag but was way neater. It went a little something like this…. 1 teaspoon (or more!) hot sauce. I used Cholula, which is awesome. 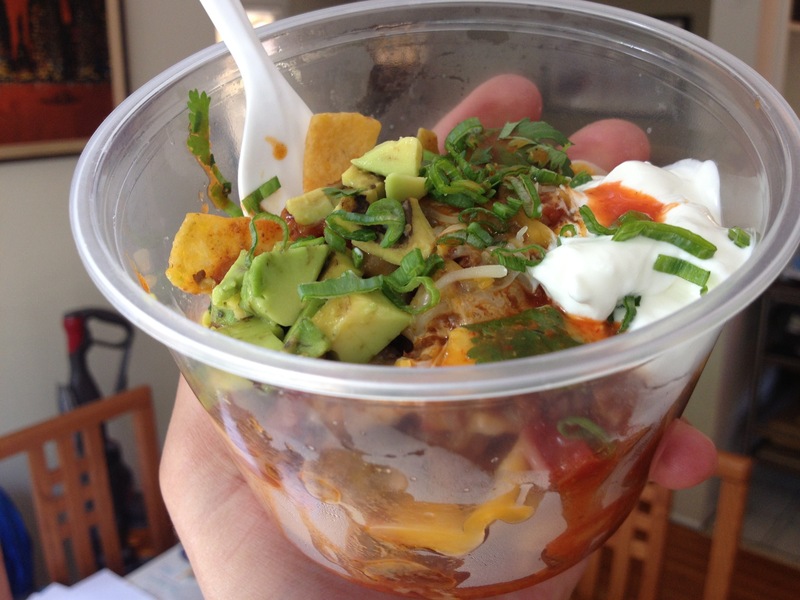 So, if you’re hankering for something that isn’t remotely healthy, try some Frito Pie. 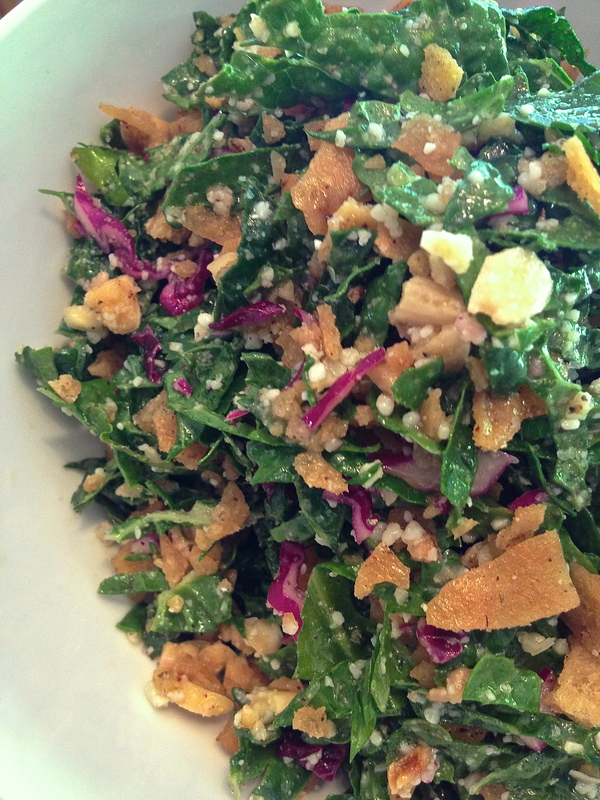 You can’t live on vegan kale salad alone, ya know! But it sho is yummy! I’ve included a basic chili recipe. This is simple chili not meant to be eaten as a main course but to go on top of hot dogs, burgers, and things like Frito Pie. To make the chili melt the butter with the oil in a 4-quart heavy-bottomed pot set over medium heat. Turn heat up to high and add the ground beef. Season beef with salt and pepper to taste and brown well. Add the onions and garlic and cook for a couple of minutes until softened. Add tomato paste and cook that, stirring around, until fragrant, about 15 seconds. Sprinkle the flour over the beef and onion mixture and stir well. Add beer and cook until the alcohol smell has dissipated. Add all remaining ingredients. Stir well to combine. Bring to a low boil and then reduce heat to low. Simmer for a minimum of 30 minutes, stirring occasionally. I like to cook it gently for at least an hour until everything breaks down nicely and the excess water has evaporated. Keep in mind that this chili is better the next day, so plan ahead if you can. It’s getting warm, which means it’s time for Today’s Salad! 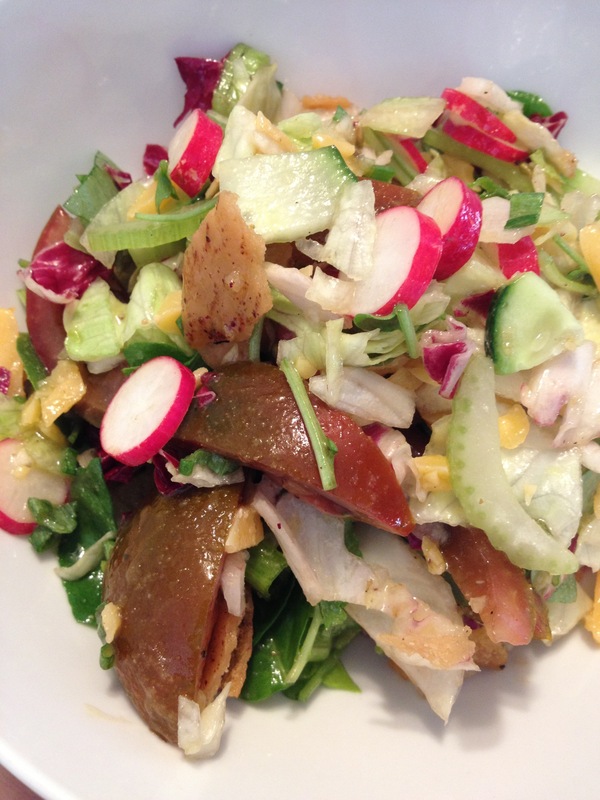 Today’s salad is a precocious, super-crunchy combination iceberg lettuce, Upland cress, radicchio, celery, French radishes, Persian cucumbers, Kumato brown tomatoes, chopped up aged Beemster cheese, and crushed crunchy pita chips (from Waleed’s). The dressing is lime juice, white wine vinegar, honey mustard, white honey, extra virgin olive oil, kosher salt, and white pepper. It was delicious and texturally fun. And great on a warm day!